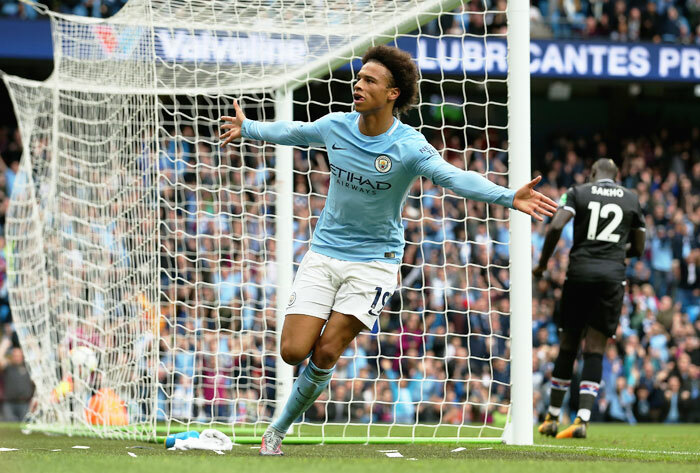 Free-scoring Manchester City turned on the style after a difficult start to the game to thrash Crystal Palace 5-0 on Saturday, taking their tally to 16 goals in their last three Premier League games. Palace had the better of the action for much of the first half, with Ruben Loftus-Cheek twice going close to breaking the deadlock, but Leroy Sane's well-taken goal on the stroke of halftime gave City momentum going into the break. After the interval, it was all City, and it was not long before they had their second, with Sane turning provider this time for Raheem Sterling to slot home six minutes after the interval. Sterling then tapped home his second and City's third eight minutes later, Sergio Aguero netted 11 minutes from fulltime, and Fabian Delph's thunderbolt at the death added the finishing touch to a result which ensures City stay top of the table, on goal difference, above rivals Manchester United. 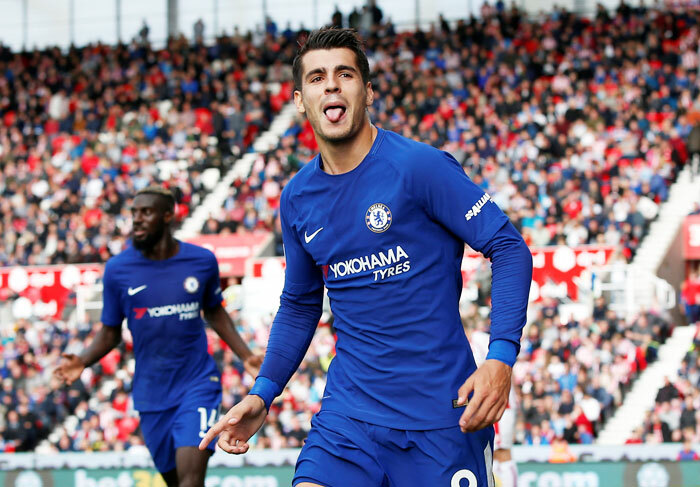 Alvaro Morata scored a hat-trick as third-placed Chelsea kept up their pursuit of Manchester's Premier League pace-setters by routing Stoke City 4-0 on Saturday. Having taken four points from home games against Arsenal and Manchester United, Stoke could hardly have anticipated their terrible start when they conceded on 83 seconds to a neat finish from Morata, his fourth goal of the season and first with his boot. But without three defenders including Kurt Zouma, Stoke struggled to stifle Chelsea's counter-attacks and conceded again after half-an-hour when Darren Fletcher mistakenly chested the ball into the path of Pedro, whose right-foot shot gave keeper Jack Butland no chance. Stoke stayed in the game until Morata finished them off with goals in the 77th and 82nd minutes, first dinking the ball over Butland and then tapping in to take his season's tally to six. Chelsea keeper Thibaut Courtois suffered an injury after falling heavily but played on. 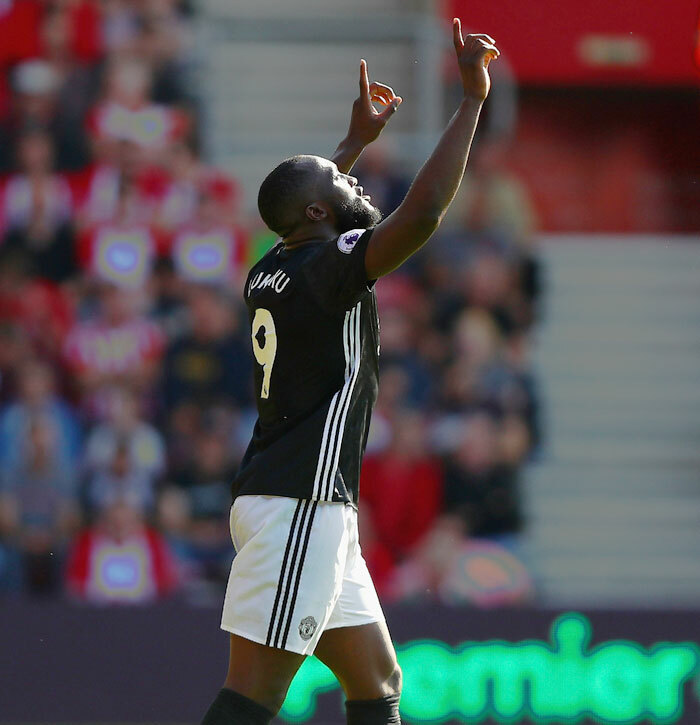 Manchester United equalled their best start to a Premier League campaign after Romelu Lukaku scored his eighth goal of the season in all competitions to give them a 1-0 win at Southampton on Saturday. The result left United second on 16 points from five games, behind leaders Manchester City on goal difference as United's prolific close-season signing became the first Premier League player to score for three different clubs against Southampton at their St Mary's Stadium, having also done so with Everton and West Bromwich Albion. Lukaku scrambled a 20th-minute winner, pouncing on his own rebound in the six-yard box after the home team's keeper Fraser Forster had parried the striker's close-range header following a superb cross from the left by Ashley Young. United had manager Jose Mourinho sent off in the last minute of stoppage time for dissent as Southampton piled the pressure in the closing stages. 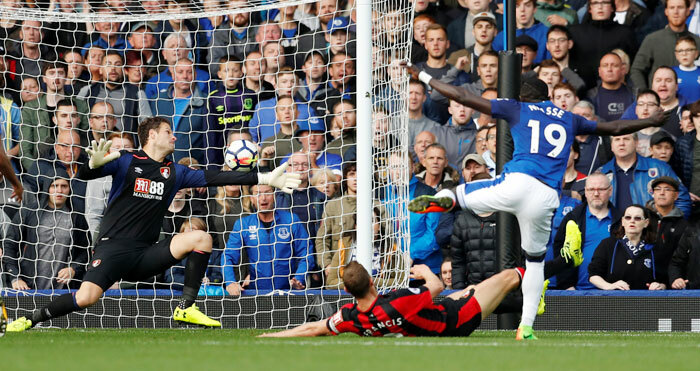 Everton substitute Oumar Niasse struck twice in the second half as the Blues clawed their way back from a goal down to notch a superb 2-1 win over Bournemouth in a spiky encounter at Goodison Park. The home side played some brilliant one-touch football in a tough first half that saw Wayne Rooney leave the pitch for treatment to a bloody wound near his left eye after an aerial duel with Bournemouth's Simon Francis. There were few chances in the opening 45 minutes but just after the break Norway international King latched on to a pass from Charlie Daniels before driving diagonally towards the penalty area and rifling the ball home. Everton poured forward and Niasse, who replaced Rooney in the 55th minute, expertly controlled a pass from Tom Davies and slammed the ball into the net before bundling home a second five minutes later to give his side a much-needed win. 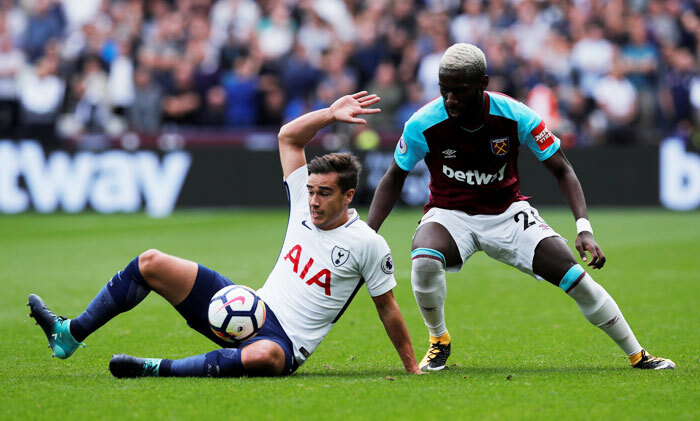 Tottenham Hotspur secured a 3-2 victory at West Ham United on Saturday, having survived a late comeback from their London rivals and played the last 20 minutes with 10 men. 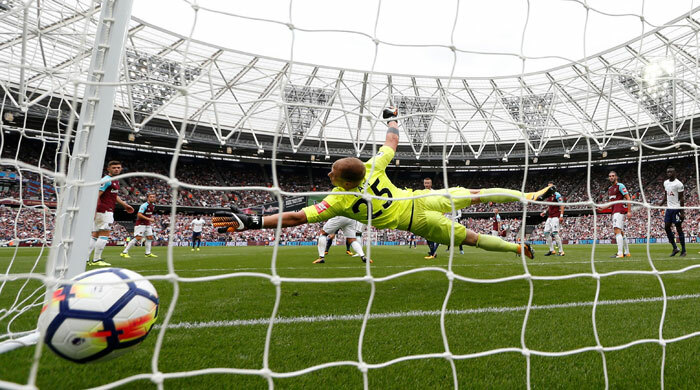 The result never appeared in doubt as Spurs dominated early on and the pressure told as Harry Kane headed the visitors into a 34th-minute lead, before making it seven goals in six games against West Ham four minutes later. Christian Eriksen expertly converted from the edge of the box to make it 3-0 on the hour mark, before West Ham's Javier Hernandez tapped home five minutes later to give the home fans hope. Serge Aurier was then dismissed for a second booking, before Cheikhou Kouyate ensured a nervy finish for Spurs after netting with three minutes to go. Spurs held on, however, for a fifth successive away win - equalling a club record for victories on the road - a success that piles the pressure on West Ham boss Slaven Bilic. Brazilian striker Richarlison grabbed a late winner as Watford beat Swansea City 2-1 in the Premier League on Saturday. Watford striker Andre Gray opened the scoring after the visitors piled on the pressure in the first half. Gray knocked in from close range in the 13th minute after Swansea's defence failed to deal with Andre Carillo's cross. Swansea introduced forward Tammy Abraham and midfielder Roque Mesa for the second half and the switch helped them to turn around their fortunes with Abraham equalising in the 56th minute, scoring Swansea's first home league goal of the season. Swansea were dominant in the second half but Watford created several late chances before Richarlison latched on to a deflected pass from Mesa and charged forward to score the winner in the 90th minute. Burnley were held to a goalless draw at home to promoted Huddersfield Town on Saturday in a Premier League game which offered little entertainment. Burnley striker Chris Wood went close with a header from a Stephen Ward cross in the 23rd minute but that was the only real effort on goal in the opening 45 minutes. Huddersfield created a chance just after the interval when Tom Ince burst from midfield and set up Laurent Depoitre but the Belgian's low shot was well dealt with by Burnley keeper Nick Pope. Ince fired wide from 20 metres out after a swift counter-attack and then substitute Rajiv van La Parra was booked for a blatant dive in the penalty area. Will India's in-form bowlers seal Aus series in Indore?